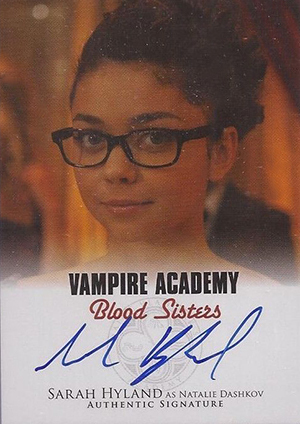 2014 Leaf Vampire Academy: Blood Sisters is another licensed movie release from the card maker. It takes the high school comedy and gives it a vampire twist. Following in the footsteps of Leaf's Mortal Instruments release, there's a lot of focus on landing autographs from key stars and delivering a low print run. Every box of 2014 Leaf Vampire Academy comes with a pair of autographs. Signers include Sarah Hyland (TV's Modern Family), Lucy Fry and Olga Kurylenko (Quantum of Solace). Kurylenko has signed before for a couplr of Rittenhouse James Bond sets, though they are relatively tough to find. The base set has 100 cards. Besides story cards, the checklist also includes spots dedicated to characters and a behind-the-scenes look at the making of the film. The insert lineup is rounded out by Crest cards and Character Crest cards. 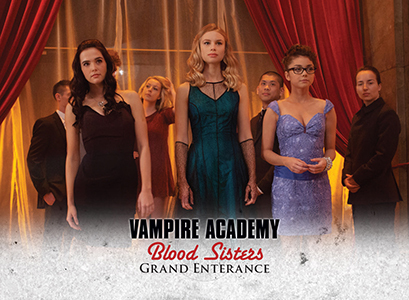 Vampire Academy: Blood Sisters is a possible start to another Hollywood franchise. Based on the first of a series of novels by Richelle Mead, it focuses on Rose (played by Zoey Deutch), a half-human, half-vampire. Set in a very special high school, the story mixes action and comedy. The film is directed by Mark Waters (Mean Girls) and written by Daniel Waters (Heathers, Batman Returns). 2014 Leaf Vampire Academy: Blood Sisters has a small print run of 199 cases. Each has 12 boxes. 13 cards. Inserted 1:12 packs.